Now it is easier than ever to make a fine precise eye liner, GOSH Cosmetics Intense Eye Liner Pen is water-based, semi-permanent and smudge-proof. Availability: Selected Edgars & Red Square stores nationwide and www.redsquare.co.za. I was a bit skeptical to try out the new GOSH Cosmetics Intense Eye Liner Pen as I am a die-hard gel eyeliner fan. I have tried several pen “liquid” eyeliner varieties before and I haven’t been blown away so I have always gone back to my trusted gel formula. My biggest issue with pen eyeliners is that I seldom find one that is as highly pigmented as the gel formula and if I am going to wear a cat eye make-up look, I want the eyeliner to be bold otherwise it doesn’t look as neat in my opinion. GOSH Cosmetics claims that their eyeliner pen is semi-permanent and they were not lying. After applying the eyeliner it did not budge at all. Now in theory this is a good thing – isn’t that what everyone looks for in a liquid eyeliner? The problem with this is that when I tried to remove it, it still did not budge! As I seldom wear a lot of eye make-up and my mascara is not waterproof, I simply use a miscellar water to remove my make-up. Perhaps if I had been using a stronger make-up remover the eyeliner would have been easier to remove. The colour pay-off of these eyeliners is very good! 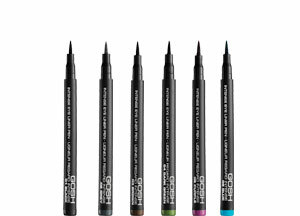 For a pen eyeliner I found them to be quite pigmented compared to other varieties I have used. I tested the black & blue shades and the blue was especially pigmented and a beautiful shade! I don’t think I will be giving up my usual gel eyeliner for these eyeliner pens. That being said, if you prefer to use eyeliner pens then I would definitely recommend these pens as so far they are they are the best eyeliner pens I have tested.